This entry was posted in MWT, Reviews, Wine. The varietal us Sangiovese as you mentioned in your discussion. In Central Italy, where Chianti is located, most of the grapes are Sangiovese. Some distinguishing properties of the grape are high in acidity and tannin, but with medium alcohol. It works well with oak and I think that’s why a lot of winemakers in the Chianti Classico DOCG region choose to either oak in traditional oak bottes or French barriques. Either way, in this wine, I really don’t taste/smell any of the oak influence. Perhaps it was used to soften out the tannins to make it more balanced? When I first tasted this, I immediately thought it was a classic Pinot Noir: lots of black cherries, dark plums, with a hint of earth. Definitely not a Cabernet Sauvignon. Not tannic enough and Merlot would have more red fruit notes. For me, this is one of those small nuances you just have to drink lots of. I think it would be beneficial if we compared a Pinot Noir from Burgundy to a Chianti Classico with Sangiovese. This wine had a great bouquet. It’s a medium (-) in body and the bouquet was rather refreshing. It’s ready to drink for sure and it won’t taste any better with age. The acidity and tannins balance all very well together. However, I did notice that the length after tasting the wine was rather abrupt. It went away almost immediately. This lead me to believe it was a low to mid priced wine. Overall, it’s got the flavours down. Dark cherry flavours and some dark plum are the dominant flavours in this wine. It’s smooth going down and a wine you can easily drink. If you’re not a big fan of overly tannic wines, this is one to try over dinner. If you like Pinot Noir and want something different, try this one out. If you like light, fruity, acidic wines, you should definitely get this one. If you like a cheaper red wine that won’t blow a hole through your nice leather wallet, this 10-11 dollar wine works perfectly. 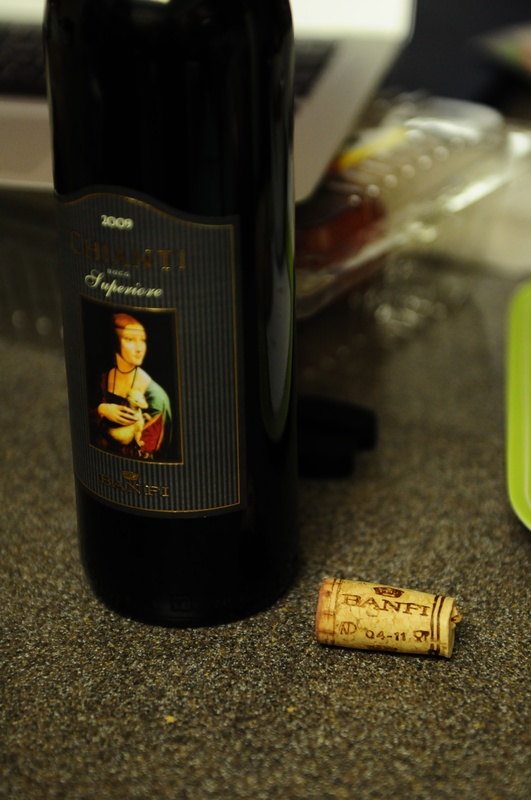 If you’re a hotelie and you’ve always wondered what the hell Banfi really is, get this wine and taste the wines that Banfi has been donating to us over the past years.